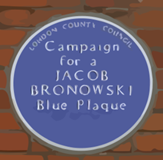 On 17 September 1842 Darwin closed the door of Macaw Cottage, 12 Upper Gower Street, in London, and boarded his horse-drawn carriage for the two-hour journey to his new home, in the village of Down in Kent (now Downe in the Greater London Borough of Bromley). Down House was originally a farmhouse, and later a parsonage. Over the forty years he lived there Darwin made extensive changes not only to the house but also to the surrounding area. One of his first projects was, with permission of the parishioners, to lower the lane that ran past his study window, and build a wall to ensure his privacy. He also put up a mirror to espy callers approaching the front door. The alterations to the building were in part to accommodate his expanding family. These included a kitchen wing with a schoolroom above, and another wing including a drawing room with verandah overlooking the garden and with bedrooms upstairs. It was on a strip of land, originally rented from his neighbour Sir John Lubbock, that he planted trees to shelter the house and laid out his famous thinking path, the Sandwalk. It was his neighbour’s son, also Sir John, by then President of the Linnaean Society, who in 1882 was influential in arranging his burial in Westminster Abbey. Darwin’s own choice would have been to be buried alongside his brother Erasmus, in St Mary’s churchyard, Downe, where his wife Emma and several of their children are also buried. 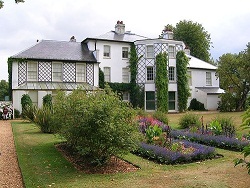 Only 16 miles from the center of London, in Downe, Down House, now under the management of English Heritage.